A spray bottle – you will need to spray about a quart of the concoction every evening. This can be bought from a hardware shop at a price of about $4. Big bottle of Tabasco sauce – you can buy this from your local grocery store; it doesn’t necessarily need to be the most expensive you can find, but ensure it is the hottest. A container – you will need a container which is large enough to store about a gallon of water in it. Last but not least you will need a gallon of warm water for the making of the concoction. Once you have all the above apparatus, you should take about one tablespoon of Tabasco and mix it in one gallon of warm water and then shake thoroughly to mix them well. This will make about four quarts of very hot concoction which will be very lethal to the bunnies taste. Then place the concoction into the bottle spray and then spray over the areas where you want to keep the rabbits away from. 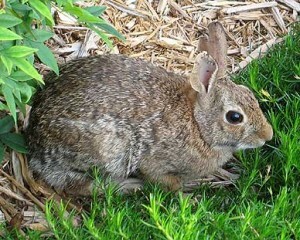 Then spray your entire garden with this concoction especially those areas you have seen them frequent most and their point of entrance into your garden; rabbits are usually creatures of habits meaning they are most likely to use the same point of entry into the garden frequently. The appropriate time for doing this would be every evening so that when they come out at night to feed they find the hot taste of pepper on their meal, they really cannot stand the taste of it in their mouth. Do it frequently and you will solve your bunny problem permanently.